So far, so good. Everyone has gained, although the littlest one hasn’t gained as much as the others, I will make sure she gets some extra feeding time today. Nina actually ran and PLAYED with Rakki outside for a minute today, she hasn’t been able to run and play for a while, and she missed it, obviously. She told me last night in no uncertain terms that she was too hot in the whelping box, so I switched the heat source from a heat lamp to a SnuggleSafe pad, and now she is more comfortable. 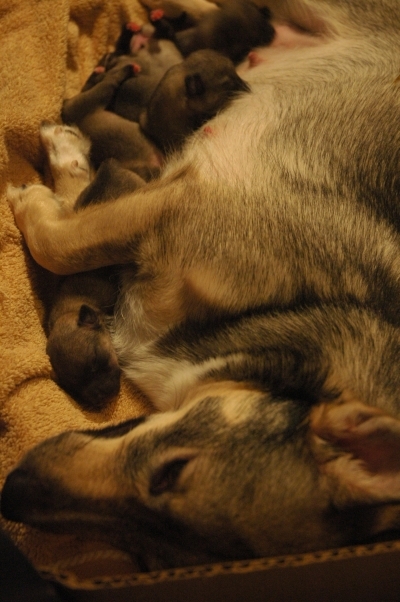 The puppycam will be broadcasting periodically throughout the day. 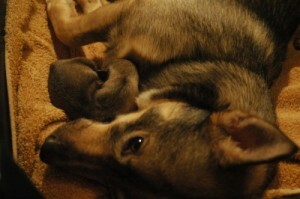 This entry was posted on Saturday, January 16th, 2010 at 9:15 AM	and is filed under Nina, breeding, dogs, puppies, vallhunds. You can follow any responses to this entry through the RSS 2.0 feed. You can leave a response, or trackback from your own site.